Bananas are one of the favorite foods in this house. I love them. The kids love them. Even the dogs love them. There is something about the flavor and texture that is at once sophisticated and elegant with comfort food roots… and that is before you make something with them. When I went to Fredericksburg, Texas for a women’s conference last month I had a bananas foster cheesecake for dessert. Actually, to be perfectly honest I had it for dinner…I mean, I do try to watch calories and I also try to keep my priorities straight, capiche? And so it happened. 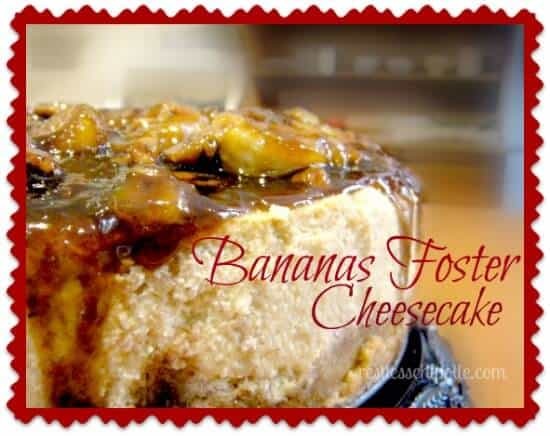 I created this bananas foster cheesecake without that artificial flavor. The cheesecake itself is airier than I usually like cheesecake to be, due to the heavy addition of bananas. The topping is a traditional bananas foster topping with the addition of pecans and bourbon rather than rum. Should you make it? Oh HECK yes. This is a fabulous cheesecake for the holidays because it is festive but different from the usual flavors of chocolate, peppermint, and rum. Prepare to lick the bowl. Seriously. 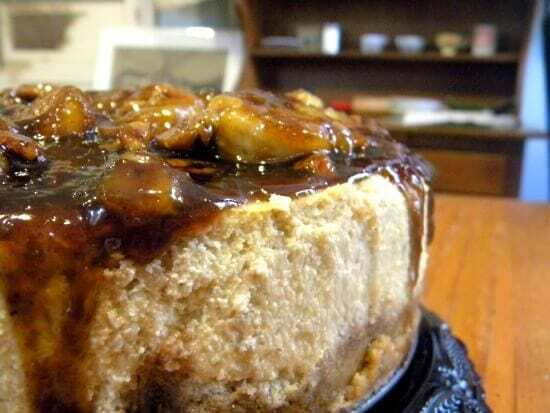 Bananas Foster cheesecake is a rich, special occasion cheesecake with banana and rum flavors. It’s absolutely delicious. If you love this recipe please give it 5 stars. A rich, special occasion cheesecake with the flavor of bananas and a topping inspired by the original Brennan's Banana Foster recipe. Grind pecans and wafers until they are fine crumbs. Mix in melted butter and press into a 10 inch springform pan. Press about halfway upsides of pan. Cover bottom and partway up the sides on the outside with aluminum foil. You will probably need to seam two pieces of foil together to make a big enough piece to fit over the pan. Place the pan in a hot water bath with the water coming about 1/2 way up the sides of the pan. Bake at 375 F for 50 minutes. Turn oven off but do not open the door. Leave for 1 hour. Remove cake from oven and water bath. Allow to cool on the counter for 1 hour. Place a paper towel over the top, cover with plastic wrap and chill for at least 6 hours. Stir in the brown sugar and cinnamon and whisk until sugar crystals disappear and butter and sugar blend. Add the banana liqueur, bananas, and pecans. Allow the bananas to soften. Add the bourbon and either simmer for another few minutes OR light on fire and pour over the chilled cake tableside for a dramatic presentation. If you have not lit the sauce, spoon it evenly over the top of the cake, reserving some as sauce to plate with. That is the place I was named after 🙂 …..Now I MUST make this cheesecake! can i make the topping a head of time? I want to make this and take it to a friends house for a party, should i pour it over my cheesecake the day of and then let it come to room temp or should I take the topping seperately, heat it up in the microwave and pour over at the party? any help would be great. I’d take the topping separately and then heat it up and pour it over the cake but you can certainly make it ahead of time for ease. I just like the combo of the hot topping and the cold cheesecake. OMGosh. I think I’ve just died and gone to Heaven. 🙂 nope… just the fore-taste! This is epic! I love bananas foster, and I love cheesecake. Wow! I hope you like it, Jan!